Technically this is a perfectly written book, Ms Emanuelle is obviously a gifted writer. I also admire the obvious research that has gone into this novel, the culinary terms and food terminology gives real authenticity to this book. The opening chapter was really inventive and had me wanting to discover more, I was mesmerized wondering where all the excitement and organised chaos was leading. However I personally found the love affair between Delphine and Jocelyn lacked passion and I found their romance difficult to relate too. The romantic side of this novel was, for me, a little clinical. 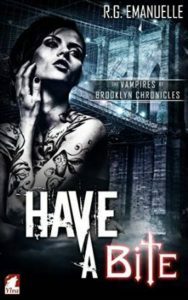 As a vampire novel, a good read. Delphine is a vampire who runs is very popular French fusion restaurant that only opens after dark. Other vampires and various supernatural groupings are not happy that she is getting so much attention as there is always a threat from the hunters, as Delphine finds out. Spies are watching her to make sure things don’t get out of hand but her main worry seems to be from a really annoying restaurant critic who just won’t give her a break. I enjoyed how this part of the story developed and it certainly kept me interested. Her vampire life seemed to consist of various hot young women offering themselves to her, until she meets Jocelyn, who seems to stir something more in her. She became quite enamoured by her but it was very drawn out and a stronger attraction was implied than I felt was evident from the story. I enjoyed the kitchen stuff though and liked the camaraderie of those working for Delphine. They were like a family and would do anything for Delphine – of course most of them were unaware of her secret life as a vampire. The descriptions of the dishes she made were mouth watering! There was a definite underlying threat in the story from someone who was killing people close to Delphine and i thought this was well teased out. I would give this book a 3.5 as it was an interesting read but didn’t grip me.